Trachten belts are popular accessories, which ladies and gentlemen love to wear with traditional German costumes. The belts look not only chic, but also prevent Lederhosen from sliding down. The diverse assortment of Dirndl.com attracts with Oktoberfest belts and the best price guarantee. 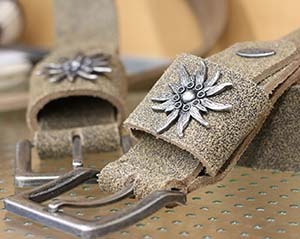 Women's and men's belts for German costumes have become popular accessories. They ensure that your favorite pair of Lederhosen or Trachten pants feel secure and fit comfortably. But even if your traditional leg dress already fits perfectly, you do never go wrong with Trachten belts. On the contrary, these eye-catchers bring elegance into your Oktoberfest look. If you are not happy with how the belt looks at home, you will of course benefit from the 100% money back guarantee. 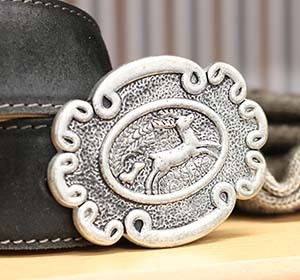 Since the high-quality belts for German costumes are made of genuine leather, they also convince with a traditional and at the same time noble appearance. Thanks to this material, these accessories are also very robust, which guarantees you a long lasting. 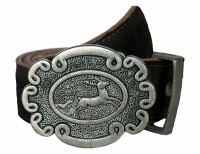 In addition, the men's and women's traditional belts are characterized by the stitching on the edge. These are very distinctive and an integral part of authentic belts for Oktoberfest costumes. 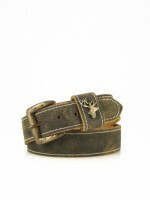 Trachten belts create exciting and interesting designs in combination with the leather pattern. By the way, the belts of course are available in different sizes. You can find every desired length in 5-centimeter intervals between 90 and 120 centimeters. When buying, make sure the belt is not too long for your traditional trousers. Otherwise, there is not much to pay attention to when buying this kind of accessory for the Oktoberfest costume. It goes without saying that it should go with the rest of the outfit. Ladies and gentlemen also love to wear traditional belts because it’s super easy to wear them authentically, correctly and in style. You simply pull your model through the loops of your pair of Lederhosen, close the belt and it completes your costume chic. Gentlemen combine traditional trousers such as Lederhosen, a plaid shirt, waistcoat and traditional jacket with their belt. Ladies put on Lederhosen combined with a Trachten bodice or a Trachten blouse. Women's and men's Oktoberfest belts are particularly suitable for the outfit, if the motifs are recurrent. For example, if stags are found on the lining, they should also be found on Lederhosen, Dirndl or shirts. Many ladies and gentlemen now discover that Trachten belts are not only part of a national costume at Oktoberfest and folk festivals. They also like to combine the belt with a pair of jeans, where it peps up the everyday look. Go ahead and try it out!